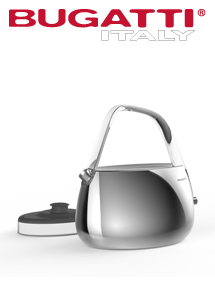 Bugatti bring you the new Jacqueline smart kettle perfect for connoisseurs on lovers of tea. With a 1.2L capacity, 1hour keep warm function and 40˚C-100˚C temperature control what more could you need? Equipped with a Smart LED display that, shows the water level and Temperature. Want to get your kettle boiling before you get to the kitchen? Use the B Chef application for your smart phone and pre-programme a time for the boil to start.